On my way home from work today, I had two very random moments. Surprisingly, they both made my heart skip a bit. As I was driving home from work, half way through the journey I looked at the plate of the car in front of me and walla... the car has a Purdue Alumni plate frame. Honestly my heart did skip a bit as I wasn't expecting to see any or that many Purdue Alums around here; and the fact that one was driving in front of me gave me a sense of pride and some sort of connection. Weird, I know. Even though I'm not big on school spirit or anything of sorts, moments like that, knowing you're not the only one of your kind around makes me all giggly inside. The crazy part of me was tempted to pull up next to the car, roll down my windows and yeah out Boiler Up! on the top of my lungs, but the sane part of me got the best of me and was happy just following behind and seeing those gold shinny words. At that moment, I thought to myself there's no way this person or anyone would know if they were to spot me and are crazy enough to yell out Boiler Up! So, I find myself online now trying to find and order my very own gold and black plate cover to adore my car with. One of those moments. Second random moment happened a couple of minutes away from home. Before I started driving after work, I had taken off my shoes and tucked them under the seat. So here I was making the final turn onto my street when all of a sudden a felt a furry thing rubbing my foot. I freaked out and almost jumped out of my skin. Why? because I thought it was a mouse. I freaked out so much in that split second a lot of thoughts were running through my head. Thoughts like I can't stop driving, there are cars behind me and I can't keep driving because there's a mouse in my car. My foot was off the pedal for some few seconds while I was trying to figure out what to do. Next thing, I looked down and it was my shoe. LOL! It was a suede shoe and that was what I felt NOT a mouse. I was pissed but as the same started laughing because I almost lost my mind. Lesson learned; stop putting my shoes under the driver's seat. Don't have to tell me that twice. I love random moments like this because whenever it comes back to me, I just start laughing. I remember a time back in college when I was absolutely sure my car had been stolen. Yes, someone came to my apartment and drove it off the parking lot or came with a truck and towed it away. Those were my theories, only to find out later that I had actually driven to campus that day. After class instead of going over to my car like a regular person would do and drive back, I hopped on the bus. And what do you know, when I arrived back at my apartment, my car wasn't where I believed it should have been. This one was bad because It took me a couple of hours to figure out what had actually happened. By that time I had already called my sisters, hubby(boyfriend at the time) and started crying. Sometimes I think this kind of stuff only happens to me. Smh! I was walking down the street in Charlotte, NC wearing my Purdue hoodie when these two men yelled Boiler Up!! I see Purdue plates a lot out here in Atlanta and trust me I yell Boiler Up when I can. 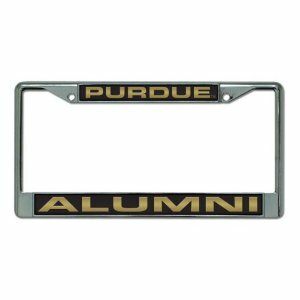 Also, we got the plate tags for Senior Send off so you know my baby reps Purdue all day!!!! Lucky you...definitely not a lot of us around here. And I'm jealous you guys got the place frame. The closest thing to that we got was a sticker and I'm not a big fan of stickers on car. Only a weirdo knows a weirdo.